Do you have memory problems? There are no effective treatments for MCI. Men and women aged over 60. Do not have other serious ongoing health problems. A short screening session over the phone. Two tablets morning and night. Travel to study centre at Western Sydney University, Campbelltown (NSW). The study drug has the potential to improve your memory and thinking, however, neither you nor the research team will know if you are taking the study drug or a placebo. You will receive 12 weeks free supply of the study drug at the end of the trial. You will receive feedback about your mental condition at the end of the study, and information on what you can do to reduce your risk of future cognitive decline including further clinical trial opportunities if applicable. You will be reimbursed up to $180 for your travel expenses. Have you noticed a decline in any of the following mental abilities? Please tell us why you decided to sign up for this trial. 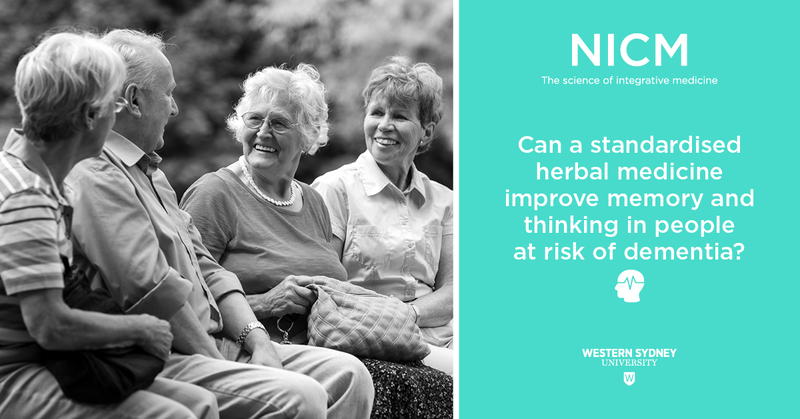 Can a herbal supplement improve cognitive decline?